This week's spotlight focuses on Who, a long-standing guild that balances teamwork and friendship with impressive GvG and open-world combat skills. Ever since launch day, the guild simply known as Who have been carving out their own piece of Albion – and having a good time doing it. We spoke to guild leader Juliecat to learn more about Who's approach to the game. We really love open world - both large and small scale. I’d say we shine in smaller-scale PvP 10-15 people or under. We also have a GvG team that does well competitively, so those two things are what we gear towards. We like members who are friendly and chatty (Discord is popping off throughout the day, everyone is pretty good friends with each other and interacts a lot) and also people with a willingness to learn and improve in PvP. We are primarily NA focused, and while we still have activity throughout the day, from around 00:00 UTC up until reset is when we are most active. We are based out of Mercia, and we have a home plot in Femur Mound. Oh gosh... yes? All of the above? We were formerly in POE and had a bit of quarreling when we left, though it’s cleared up to “light banter” at this point - nothing too serious. It’s also worth mentioning that we love mining salt from TheGreenBastard (representing Deadwood guild) when he visits our territories to talk trash every night. That’s definitely the funnest rivalry. In my opinion, the absolute best battle we’ve ever had was when we were in the ALONE alliance, and fought over Coombe Tor warcamp outnumbered vs POE. It was absolutely insane and there were bodies dropping everywhere. Another time (seen in the video below) we took our guild plus a few friends from our alliance and Derrick from Money Guild (before we were in OOPS or OOF) and plopped ourselves in the middle of Grisdale territory. We fought with POE for a long time, up until the game kicked us all out at server reset. 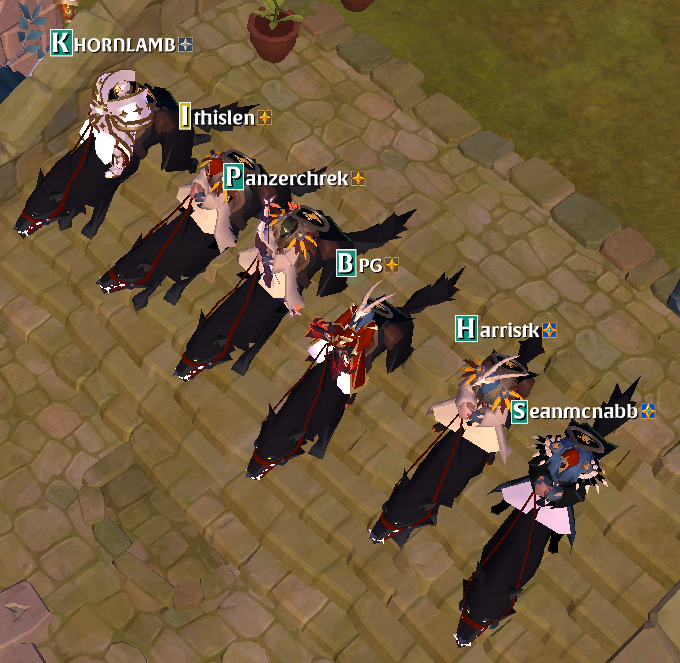 One thing I really love about my guild is the fact that everyone here is pretty well-rounded as players. We have people who go out and gather/craft for fun, and we have a lot of people who go ganking every single night for hours and hours together. Warcamps are always fun, as well as grouping up and going mage raiding for content during seasons. We really like to fight in the open world, so we do a lot of things based around that. We also do a lot of stupid stuff like ganking in the black zone with a full party of Bedrock Maces on t3 oxes and bing-bong people around when we encounter them, as well as roleplay as police on the Royal Continent. We once held a “Who Fun Day”, where we placed a bunch of present boxes around a zone we owned, filled them with T2-4 items, and did a “Hunger Games” style event where everyone starts naked together. When the timer started, everyone had to run around grabbing gear and fight until there was only one person left. Our approach to the game is to support people in doing what they want. One reason I freaking love to lead this guild is because anytime someone new comes and joins, my guys immediately see what they like to do and include them in things related to that. Wanna gather? Great! Wanna gank? Great! Our members pretty much support whatever someone wants to do, with an eye towards overall guild unity and well-roundedness. Goals for the future are to continue growing our guild with awesome, solid members, and continue to have fun, while being an excellent and worthy asset to our awesome alliance. It’s worth it to mention here that the alliance we are currently in - OOF - used to be literally just our guild and Money Guild, and our goal as a guild is to continue to grow in size as well as individual members, as well as support our alliance friends in doing the same. ULTIMATE goal in the world of Albion? Man, I just want to watch my guys have fun. It’s also my goal for the guild and its members to get the respect they deserve for the accomplishments we've made and will continue to make. "We like to have fun." “MAKE SURE THEY KNOW WE DON’T GATHER FLAT T7 LIKE HEATHENS."